Eyke village, 3 miles south east of Wickham Market and 4 north east of Woodbridge, straggles the busy road between Woodbridge and Snape, although, since the closure of the nearby American airbase, it is much quieter than it used to be. Eyke is thought to derive from an earlier word meaning "oak". In Saxon times, an oak forest covered the area. 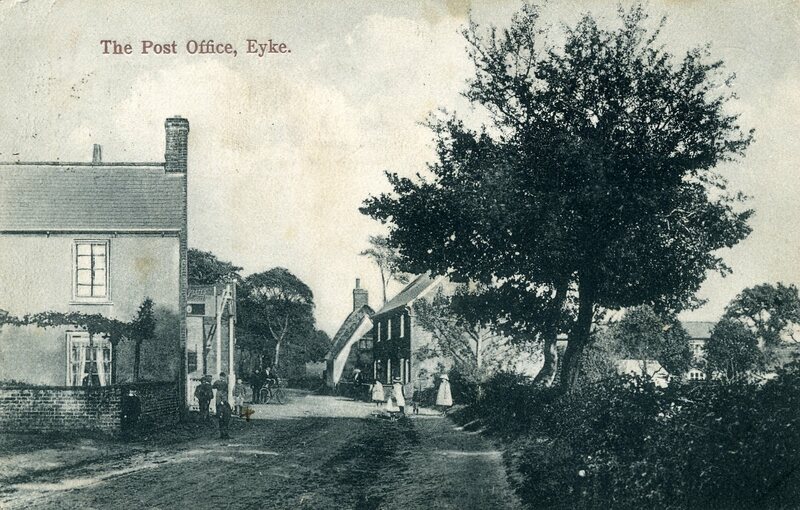 Dee Hall, who lived in Eyke as a child and has researched the village, suggests a different explanation of the name: "Eyke" was actually an 'olde English' translation for the word "Key". 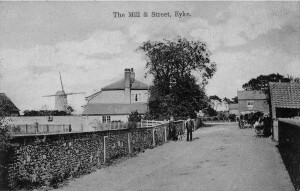 The village was the final community before reaching one of King Richard's Anglican 'country castles' or "the key" (Eyke) before the castle's gate. 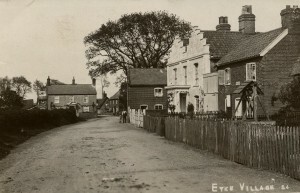 Robert and Elizabeth were living in Eyke in Suffolk in the 1650s, during the rule of Oliver Cromwell. Both were born in around 1630. Elizabeth gave birth to a daughter, also Elizabeth, who was baptised in Eyke Parish Church on 7 November 1652. Four years later, she gave birth to a son, Robert, who was baptised at the same church on 26 May 1656. Elizabeth senior died in Eyke in 1700 and was buried there on 24 October. On 25 September 1683, Robert married Sarah Doughtey at Marlesford Parish Church. Sarah was originally from nearby Framlingham (she was baptised at Framlingham Parish Church on 1 October 1660). Robert and Sarah settled in Campsea Ash for a while, where Sarah gave birth to three children: Sarah (baptized 21 June 1686), Mary (baptized 18 May 1688) and John (baptised 10 February 1689). They then moved to Eyke where Sarah gave birth to Hannah (baptised 23 September 1694) and Robert (baptised 28 March 1702). Marlesford is 4 miles north of Eyke, on the river Alde, just off the A12 between Wickham Market and Saxmundham. The Framlingham branch of the Great Eastern railway used to pass through the parish and there was a station in the village. There are osier beds and sandpits in the vicinity. Campsea Ash (sometimes spelt Campsey Ash) is 3 miles to the north of Eyke and 1 mile south of Marlesford on the east side of the river Deben. Wickham Market station is located here. The village was the site of a nunnery of the order of St. Clare, founded in the latter part of the 12th century. Some time before 1711, Sarah junior married a man named Daniel Luffe, about whom we have no further information. Robert senior died at the age of 54 and was buried at Eyke on 30 May 1711. He left a will, dated 26 April 1711 in which he left his ‘messuage or tenement...in ..Eyke‘ to his wife Sarah. At the time the property was tenanted by John Cutting. On Sarah‘s death the property was to pass to Robert‘s daughter Hannah ‘and her heirs for ever‘ but if Hannah had no heirs the property would pass to Robert‘s son Robert ‘and his heirs for ever‘. Bequests were made as follows: to son John £5; to daughter Mary £5; to daughter Sarah LUFF forty shillings - these lagacies to be paid within 12 months of Robert‘s decease. To son Robert £5; to daughter Hannah £5 - these lagacies to be paid on reaching the age of 21. The rest of Robert‘s estate was to be given to his wife on condition that ‘she keep and provide for my two younger children until they attain to their age of one & twenty years‘. Sarah was to be the sole executrix of the will. An inventory of Robert‘s goods taken on 11 June 1711 valued the goods at £63. However, Hannah died in Eyke at the age of 17 and was buried at Eyke on 29 April 1712. In 1714 in Ufford, at the age of 26, Mary married William Beadon, who was 29. We have found no record of Robert junior having married. He died at the age of 60 and was buried at Eyke on 25 April 1762. Sarah senior died in 1730 in Eyke at the age of 69. John and Ann settled in Marlesford where Ann gave birth to two sons, William, (bap 5 March 1716) and John, (bap 24 August 1718). They later moved to Shottisham where Ann had a further three children: Anne (bap 3 November 1721), Robert (bap 4 October 1723) and Matthew (bap 19 December 1728). Shottisham is a small village located 6 miles southeast of Woodbridge near Shottisham Ford, on a creek of the river Deben. The family then moved to Eyke, where Ann gave birth to a daughter, Mary, who was baptised there on 19 November 1731. Ann died on 13 July 1747 at the age of 52 and was buried at Shottisham. On 15 November 1752, at the age of 34, John married Sarah Whitwell (or Whittle) at Campsea Ash Parish Church (see below). We have no trace of what happened to William, Anne, Robert, Matthew or Mary. For a while, John and Sarah lived in Campsea Ash, where Sarah gave birth to Ann (baptised 20 May 1753), William (baptised 13 August 1758) and John (baptised 18 January 1761). They then moved to Eyke where Sarah gave birth to Samuel (baptised 10 April 1763) and Matthew (baptised 25 December 1767). There may have been a further daughter, Elizabeth, who died in childhood in Eyke in 1770. On 17 June 1777, at only 16, John married Jemima Utting (aged 21) at Campsea Ash Parish Church. They had at least three children, all baptised at Campsea Ash: John (7 June 1778), William (17 April 1785, who died in infancy and was buried on 9 April 1786) and Elizabeth (1 March 1789). There may have been a further daughter, Ann, who died in infancy and was buried at Campsea Ash In January 1783. Jemima died at 41 and was buried in Campsea Ash on 14 May 1797. In 1841, John was living in Church Street, Fressingfield, with John and Maria Cousins and their 2-year-old daughter, Mary Ann. John died in 1849 at the age of 87, having outlived his wife by 48 years. In 1780, at the age of 26, Ann gave birth to an illegitimate daughter, Ann, who was baptised at Campsea Ash Parish Church on 30 April. On 13 January 1789, at the age of 21, Matthew married Ann Lucock at Melton Parish Church. Matthew was a labourer and probably also a volunteer in the militia. We are aware of four children, all baptised at Eyke: John (21 March 1790), Sarah (4 March 1792), Samuel (9 April 1794, buried 13 April, aged 5 days) and Matthew (26 February 1799, buried 4 March, aged 6 days). He died at the age of 39 and was buried at Boyton, Suffolk, on 11 April 1807. Sarah senior died at the age of 65 and was buried at All Saints, Eyke, on 6 November 1792. On 26 March 1793, at the age of 34, William married a 27-year-old girl named Elizabeth Johnson at Eyke Parish Church (see below). We have no record of what happened to the other children, Samuel and Matthew. John died at the age of 82 and was buried at All Saints, Eyke, on 25 March 1801. William and Elizabeth had at least seven children, all born and baptised at Eyke: Mary Ann (born 13 December 1793, baptised 15 December), Samuel (born 8 April 1794, baptised 9 April), William (born 12 July 1797, baptised 19 July), Martha (born 13 July 1800, baptised 31 August), Elizabeth (born 21 September 1802, baptised 21 September), John (born 1 June 1805, baptised 16 June) and Sarah (born 6 May 1808, baptised 8 May). On 4 February 1817, at the age of 23, Mary Ann married Jonathan Nunn, a thatcher, at Snape Parish Church. In 1841, they were living in Wickham Skeith with their sons William (25) and John (23). In 1851, Jonathan was lodging with James and Lidia Hails at Parish House, Pettaugh. Mary Ann is nowhere to be found. By 1861, Jonathan and Mary Ann had moved to 7 Heigham Folgate, St Benedict, Norwich, where they were living with their two unmarried daughters, Elizabeth (36) and Harriet (31), and a 4-year-old grandson, William. Jonathan was working as a grocer. On 22 May 1823 at Eyke Parish Curch, at the age of 25, William junior, a carpenter by trade, married Matilda Fosdike, a local girl of 18 years, the daughter of Mark and Mary (nee Clouting). They had a son, Robert, who was baptised in nearby Rendlesham on 11 May 1824 but both Matilda and Robert died just two weeks later. On 2 December 1828 at Snape Parish Church, at the age of 31, William married again, this time to Mary Jane Sawyer, a 23-year-old girl from Woodbridge (she was baptised at St Mary‘s Church on 10 December 1804), the daughter of William and Jane, nee Manthorpe (see below). Rendlesham is a village located 4½ miles northeast of Woodbridge. It was formerly a market town and was a royal centre of authority for the king of the East Anglians. More recently it was the site of the Rendlesham Forest Incident, a series of reported sightings of unexplained lights and objects in the sky in December 1980. Snape is a small village on the River Alde close to Aldeburgh. It has about 600 inhabitants. Snape is now best known for Snape Maltings, no longer in commercial use, but converted into a tourist centre together with a concert hall that hosts the major part of the annual Aldeburgh Festival. On 27 July 1824, at Thornham Magna Parish Church, Samuel, who was also a carpenter, married Sarah Freeman, a 21-year-old girl from Thornham. In 1841, they were living at Handford Road, Ipswich, with their five children, Caroline (15), Sarah (10), Elizabeth (8), William (6) and John (3). In 1851 they were living at St Georges Street, Ipswich. In 1861, they were living in Norwich Road, Ipswich, with their 19-year-old son, Samuel, who was working as a plumber and glazier. Samuel died at the age of 72 and was buried in Ipswich Cemetery on 12 October 1867. In 1871 Sarah was living in Balkerne Hill, Colchester, with her son Samuel. In 1881 she was living at 3 Beaufort Street, Ipswich. In 1891 she was living at 52 John Street, Ipswich, with her daughter, Caroline, and son-in-law, Alfred Warren. Sarah died at the age of 88 and was buried at Ipswich Cemetery on 13 April 1891. John, who was also a carpenter, married a girl from Leiston originally named Lydia Smith. Lydia was the daughter of John and Mary Smith nee Savage and was baptised in Leiston on 28 August 1814. Lydia had previously been married to William Hurren (they married in Eyke on 6 August 1837), by whom she had given birth in 1838 to a daughter named Elizabeth. In 1841 John, Lydia and Elizabeth were living in Eyke. John and Lydia had numerous children, all baptised in Eyke, many of whom died young: Marianne or Mary Ann (22 August 1841), Anna (23 April 1843), George (1 December 1844, buried 28 April 1847), William 1 November 1846, buried 19 November 1848), Amelia (24 December 1848, buried 5 September 1864), George William (27 October 1850, buried 22 July 1865) and William (7 January 1855, buried 10 February 1856). In 1851, John and Lydia were still living in Eyke with five of their children (Elizabeth, Marianne, Anna, Amelia and George) and a 14-year-old servant named Susan Prike. By 1861, John was employing 6 men. He and Lydia were still in Eyke with their surviving children (Elizabeth, Anna, Amelia and George) and a 6-year-old nephew named Horace Simpson. In 1871 John and Lydia were still living in Eyke but all their surviving children had left home. Lydia died at the age of 60 and was buried at Eyke on 16 January 1874. John died at the age of 73 and was buried at Eyke on 18 February 1877. We have no record of what happened to Martha or Sarah. William senior died at the age of 80 and was buried in Eyke on 9 September 1838. Elizabeth junior remained unmarried and in 1841, at the age of 39, was still living in Eyke with her mother, who was then 75. On 6 April 1849 Elizabeth senior died of old age at the age of 84. She was buried in Eyke on 14 April 1849. William and Mary Jane settled in Eyke where, between 1829 and 1842, Mary Jane bore at least seven children, all baptised at Eyke: William (bap 1 November 1829), John William (bap 6 May 1832), Matilda (bap 8 December 1833), Jane (bap 11 September 1835), Robert (bap 1 July 1837), Sarah (born 19 January 1840) and Elizabeth (bap 14 March 1842). In 1832 William built a new west window in the Parish Church at Eyke, for which he was paid £11.11.3d. This may have been the "extremely ugly house window" which, according to the published History of Eyke Village and Church, was replaced by a "most beautiful one" in 1893. At the time of the 1841 census, William and Mary were living in Eyke with their six children. In 1844, William and Mary Jane lost two of their children. On 10 November, Matilda died of brain fever (encephalitis) at the age of only 11. On 16 November, Elizabeth, who was only 2, died of typhus fever. Both were buried at Eyke Parish Church. On 10 January 1847, Mary Jane bore another daughter, named Mary Jane (but more often known as Mary Ann). At the time of the 1851 census, William and Mary Jane were still living at Eyke with their surviving six children. On 25 December 1851 at Eyke Parish Church, at the age of 22, William junior, a carpenter, married a 19-year-old local girl, Sarah Clarke, the daughter of Abraham and Hannah Clarke. They had five children baptised in Eyke: Elizabeth (1 April 1852, died 20 April 1852), Matilda (28 August 1853), William (26 August 1855), Robert (18 April 1858) and Elizabeth (29 July 1860). By 1861, William and Sarah had moved to Bawdsey Road, Alderton, where they were living with their four surviving children: Matilda, William, Robert and Elizabeth. On 4 September 1864, Sarah had a further son, Henry George, who was born in Eyke. By 1871, they had moved again to West Firle in Sussex and were living in a house called The Dock (which, according to the 1891 census, was at 15 Firle Street). In 1876 Sarah had a further son Earnest. In 1881 their two younger sons (Robert and Earnest) were still living with them. In 1891 Earnest, who was 15, was still at home and a grandaughter named Ethel E was also living with them. Sarah died in 1899 at the age of 67. In 1901, William, then 71, was still living at The Dock with his son, Earnest (25), daughter-in-law, Mary (37), and granddaughter, Ethel (13). William died in 1908 at the age of 78. Sometime between 1851 and 1858, John William, who also became a carpenter, left home and made his way to Hockerill in Hertfordshire. On 29 May 1858, he married Susan Elizabeth Bush, a 26-year-old from nearby Bishops Stortford at All Saints Church in Hockerill. Susan Elizabeth was the daughter of John Bush, a coach painter from Great Bardfield in Essex, and his wife, Susanna (see below). Hockerill became more prominent on the map in 1670 after Charles II instigated the building of the Hockerill ‘bypass’, and as more and more travellers, including royalty, used the more convenient route between London and the towns and cities of East Anglia, the four inns at its crossroads gained fame and fortune. In fact, during the 18th century Hockerill’s wealth was greater than that of Bishop‘s Stortford itself. But with the arrival of the Railway in 1842 and the demise of mail and stagecoach services that had made Hockerill so popular, its prosperity ended as abruptly as it had begun. By now, though, it was no longer a hilltop outpost. Meanwhile back in Eyke, on 7 June 1858, another of William and Mary Jane‘s daughters, Jane, died at the age of 22, from epileptic fits and a coma. In 1861, William and Mary Jane were still living in Eyke. Three of their children were still living at home: Robert, who was 23 and working as a carpenter; Sarah, who was 21 and working as a dressmaker; and Mary Ann, who was 14. 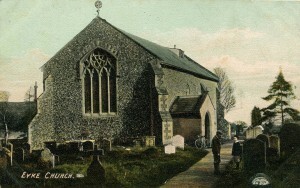 On 20 May 1862 at Eyke Parish Church, at the age of 24, Robert married Emily White, a 28-year old girl from Bungay, the daughter of Samuel White, a labourer. This was Robert‘s second marriage: his first wife had died but I don‘t have details. By 1871 Robert and Emily had moved to Mile End Old Town where they were living at 45 Allard Road with their two sons, Robert G and Walter E. By 1881 they had moved again to West Ham and were living at 87 Disraeli Road. Robert senior was working as a carpenter. Robert (17) was working as a painter and Walter (13) as an assistant in a grocer‘s shop. Robert senior died in 1887. In 1891, his widow Emily was living at 2 Middle Road with her two sons and a nephew, Walter Thurkettle (18), the son of Mary Anne (see below). In 1901, Emily was still living at Middle Road (although at number 3 according to the census), still with her two sons, neither of whom had married. On 20 April 1863 at Eyke Parish Church at the age of 23, Sarah married George Patrick, a 34-year-old bricklayer from Ufford, Suffolk, the son of Samuel Patrick, a miller. By 1866, they had moved to Forest Hill. In 1871 they were living at 1 Laburnum Cottages, West Road, with their five children, Susan (7), Mary Ann (6), Charles (5), (Sarah) Elizabeth (4) and (Mary) Alice (3). In 1881, they were at 18 Beadnell Road with their five youngest children, Elizabeth (13), Alice (12), Rose (8), Noah (7) and Violet (11 months). In 1891 they were still at 47 Beadnell Road with Noah and Violet. Noah was working as a butcher. By 1901 George had died and Sarah had moved back to Suffolk and was living with her eldest daughter, Susan, at Deben Villa, Deben Road, Woodbridge. By 1911 Sarah (who was by then 71) was living alone at Leeks Hill Cottages, Melton (which is about a mile north-east of Woodbridge). By 1867 Mary Anne had moved to London and, like her elder sister and brother-in-law, was living in Forest Hill. On 25 December 1867 at St Saviour Parish Church, Lewisham, at the age of 22, she married Edward Thurkettle, a 24-year-old railway porter from Suffolk, who was also living in Forest Hill. He was the son of William Thurkettle, a carpenter. They had at least seven children, all born in Mile End: George (born 1869), William E (1871) and Walter (1873, who presumably died in infancy), William (1871), Agnes (1873), Walter (1876), Harry (1878) and Ada (1881). In 1871 the family were living at North Terrace, Mile End Old Town. By 1881, they had moved to 10 Portman Place, also in Mile End. In 1891 they were living at 15 Railway Street, Bromley (although Walter was living with his uncle Robert and aunt Emily in West Ham (see above). In 1901 Edward was living, apparently alone, at 377 Grosvenor Buildings, Manisty Street, Poplar. But in 1911, he and Mary Ann were living together at 17 Willow Grove, Plaistow. By 1871, William and Mary Jane had joined their daughter, Sarah Patrick, and her family at 1 Laburnum Cottages, West Road, Forest Hill. This meant that the whole family had left Eyke by 1871, with all except the oldest son, William, having migrated to the east end of London. Forest Hill is one of the highest hills in London with spectacular views towards central London and the North Downs. Originally part of the Great North Wood, providing timber for the great dockyards at nearby Deptford, until the mid 19th century Forest Hill was sparsely inhabited with charcoal burners and woodsmen. The opening of the Forest Hill Station (originally under the name of Dartmouth Arms) on the London & Croydon Railway in 1839 gave the first great boost to the development of the suburb. West Road was part of the West Kent Park Estate, which was located in the north-west angle of Stanstead Road and Brockley Rise. The estate was laid out around 1850 by a Farrington Street wine merchant named Arthur Gurney. He was lucky to buy the fields a few years before the Crystal Palace boom hugely inflated the land prices in the area, but unlucky to have sold it again almost immediately in small plots. As a result West Kent Park became a rare poor area, almost a slum, in the middle of wealthy Forest Hill. Nearly all of West Kent Park was demolished in the 1970s and replaced by flats. Mary Jane died at West Road on 15 February 1872 at the age of 69. The cause of death was given as paralysis. William died on 19 January 1878 at the age of 82. The cause of death was traumatic erysipelas. By then he was living at Clyde Terrace, also in Forest Hill. Clyde Terrace still exists. It is a few minutes‘ walk from Forest Hill station, abutting the western side of the railway line. By 1860, John and Susan had moved to Plaistow, where they were living at 10 Custom House Terrace. It was here that Susan gave birth to a son, Walter John, on 9 June 1860. Plaistow is about 5 miles from the City of London in the centre of the east London Borough of Newham. The name ‘Plaistow‘ is probably derived from a man who was once the area‘s Lord of the Manor - Hugh de Plaiz. ‘stow‘ means a village, thus it is the ‘village of Plaiz‘. Another, lesser, theory is that it meant a ‘playplace‘ or village green. Many variations on the name can be found on old maps or documents of the area, some going back to the 13th century. i.e. : Pleystow; Plegstow; Plestor; Plastow; Playstow; etc. Before the eighteenth century, the area was very sparsely populated. It was a rural Essex community bounded to the south by marshland (Plaistow Level) which led down to the River Thames. The area north of the marsh consisted mainly of open woodland with the occasional path for the few travellers. A little further north was once the southern edge of Epping Forest. Old Plaistow developed on the edge of the firm ground above the marshes. In the 18th century the area became more fashionable and attracted some of the more affluent residents of London seeking a country retreat within reach of their city homes. When Daniel Defoe passed near Plaistow in 1724 on his "Tour through the Eastern Counties" he commented that it was "chiefly for the inhabitation of the richest citizens, as are able to keep two houses, one in the country and one in the City, or for such citizens as being rich and having left off trade, live in this village for the pleasure and health of the latter part of their days...". In the nineteenth century, during and after the building of the nearby Royal Docks, Plaistow became the home to more and more construction workers, dock workers and others. Housing was built on the pastures. Construction was further stimulated by the opening in 1858 of the London Tilbury & Southend Railway to Barking, with a station at Plaistow. A railway works was opened at Plaistow in 1875 (and remained active until 1934). Katherine Fry, writing in the 1890s described the area as of little interest to anyone except market gardeners ... The rural village of Plaistow is no more, it has been swallowed up in the town of Plaistow. The wealthy citizens and merchants have left, most of the interesting old mansions have been demolished and their sites covered with houses for the working classes. The whole district has become a busy place of industry and commerce and the population may now be reckoned at rather more than 70,000 inhabitants". Eventually Plaistow was swallowed up by the expansion of London itself, and was transferred from being a rural Borough of West Ham in Essex to being part of West Ham as a London Borough In 1965 West Ham combined with neighbouring East Ham to form part of a large new single London Borough, known as Newham. In recent years, the area has changed again. Heavy industry has moved away and major redevelopment has taken place, funded firstly by the London Dockland Development Council and then by European Community grants. The docks have ceased their original activity and become marinas, water sport facilities or just scenery for waterside homes. Luxury homes have been (and are still being) built, located along dockside and riverfront where only a few years ago rows of large factories reigned and no one wanted to set up home if they could help it. A new major road system has been built through the area, east to west, to link central London with city commuters from the eastern counties and heavy traffic from the container port of Tilbury. Redevelopment has landscaped much of the area, with the new wide roads having grassed and planted areas running alongside them. London City Airport, The Thames Barrier, a giant new University campus (UEL), a National Exhibition-Conference Centre (ExCel), and large Retail Parks are other major additions and more is to come including up-market homes and shopping areas, making the area the ‘Eastern Gateway‘ to London. We have been unable to identify the exact location of Custom House Terrace. But it is likely that it was part of the housing that was built around the middle of the century on the Plaistow Levels to the north of the Custom House in the Victoria Dock. Eventually, this whole area came to be known as Custom House. Construction of the Victoria Dock was completed in 1855 and by 1860 it accounted for over forty per cent of shipping tonnage entering the north Thames docks. Construction of the Royal Albert Dock followed to the east of the Victoria Dock and this was opened in 1880. However, John and Susan did not stay at Custom House Terrace for long as, by 1861, they and baby Walter had moved to 2 Manby Park Villas, Lavender Street, Stratford. They had a house servant, a 17-year old girl from Bishops Stortford named Rebecca Everard, and an 8-year-old boarder named William Sharratt. Stratford is located to the north-west of Plaistow. Situated on the main road from London to Essex and at one of the main junctions of the Great Eastern Railway, it was conveniently located during the nineteenth century to become one of East London‘s major industrial centres. Outside the influence of the restrictions which controlled offensive trades in London and with a large area of cheap land, it provided an ideal site on which industry could develop. Attracted there by these advantages manufacturers set up soap works, glue factories and distilleries along the rivers and around Bow Bridge. The combination of the smoke and smells from the factories gave Stratford an extremely unpleasant odour, the effects of which were described by Shelley Holford in his ‘Reminiscences‘, ‘The Journey to Liverpool Street was always undertaken with a certain amount of misgiving and when the train left Stratford Station handkerchiefs were drawn out, windows closed and ladies giggled and blushed, such was the odour‘. The Eastern Counties Railway (absorbed by the Great Eastern Railway in 1862) built their line through Stratford in 1839. It was, however, the decision of the Northern and Eastern Railway in the following year to make a junction with this line that made Stratford a major railway centre serving the lines between London, East Anglia and in due course the Docks. The Eastern Counties Railway transferred its works in 1847 to a large marshland site to the west of Stratford Station. At first, these were mainly used for repairs, since most of the locomotives were bought from other contractors. However, from the 1880s, following a major reorganisation of the works, they were able to deal with all aspects of production at Stratford. By 1892 the works covered an area of 52 acres and employed about 5,000 hands. Lavender Street was part of a housing development built on the old estate of the Manby family, one of several local large landowners who sold off their land for such development in the second half of the 19th century. It still exists but I have been unable to identify Manby Park Villas. By 1862, the family had moved to nearby Chobham Road where Susan gave birth to a second son, Harry Thomas (23 April 1862). In 1864, they are recorded as living in Maryland Terrace (which we assume to have been the name of a block of houses in Chobham Road), where Susan gave birth to Susan Elizabeth (5 September 1864) and Georgina (8 February 1866). On 31 May 1868, Susan gave birth to Herbert Arthur. Herbert Arthur died of diarrhoea on 1 August 1868, at the age of just two months. On 6 June 1869, Susan gave birth to another son, Ernest Percy. However, Ernest Percy also died of diarrhoea at only two months, on 24 August 1869. Susan gave birth to a further daughter, Alice Maud, on 17 February 1871. In 1871 the family were living in a house in Chobham Road named Hockerill Cottage, clearly named after the place where they were married. In 1881, the family were recorded as living at 136 Chobham Road. The house at no. 136 is still standing, part of a row of terraced houses built in 1875 and known as Poplar Villas. It is possible that Hockerill Cottage was demolished to make way for the new houses. In 1881, John was working as a builder‘s foreman. The family also had two young carpenters from Lincoln staying as lodgers. Chobham Road is part of Stratford New Town. Originally known as Hudson‘s Town, the ‘new town‘ was built by the Eastern Counties Railway Company in 1847 to house their workers. On 17 May 1882, Susan Elizabeth junior died at the age of 17 in Whitehall. The cause of death was given as congenital curvature of the spine and meningitis. By 1882, Walter John had left his parents‘ home and was living at Leytonstone Road, Stratford. On 21 December 1884, he married Ellen Sophia Hewett, a 25 year old from Mile End, at West Ham Parish Church. For details of Ellen‘s ancestry, see the separate account of the Hewett family. By 1888 the rest of the family had moved to 161 Romford Road. It was here that John died on 26 January 1888 at the age of 55. The cause of death was pleuropneumonia. The house at no. 161 no longer exists, having been replaced by a modern housing development. By 1891 Susan, now a widow, was living at 33 Clova Road, Forest Gate, with her children Harry (28, a house decorator‘s clerk), Georgina (25, a teacher of music), Alice (20, a school teacher) and a 4-year-old adopted son named William T. 33 Clova Road, a sizeable, semi-detached property, still exists. On 16 December 1891 at the parish church in Leyton, at the age of 29, Harry married Margaret Ferguson, the 27-year-old daughter of John Ferguson, an engineer from Scotland. At the time of the marriage, Harry was living at Lindley Road, Leyton, and Margaret at Abbey Mills, Stratford. They had three children: Dorothy Marguerite (born 1894 in Southend-on-Sea RD), Ella Susie G (born about 1897) Mildred Georgina M (born in Woodbridge RD in 1906) and Harry Hohn D. In 1901 the family were living at Ivy Cottage, Melton Street, Melton, Suffolk. Harry was an organist, choirmaster & attendant. The family later emigrated to Canada. In 1911 they were living at 79 McKay Street, Ottawa, Russel, Ontario. Harry was organist at St Bartholomew‘s Church in Ottawa, Ontario, between 1911 and 1931. We have no record of what happened to Alice. In 1901 Susan was living with her daughter, Georgina, at 31 Hamfrith Road, Forest Gate, where Georgina had a residential music school. Hamfrith Road still exists but the original houses have been demolished to make way for a modern council estate. Susan died on 6 April 1903 at the age of 70. Her address, and that of her daughter, is recorded as 33 Hamfrith Road (this is presumably the same residence as the number 31 recorded in the 1901 census). The cause of death was adenoma of the colon and exhaustion. By 1911, Georgina had moved to Leigh-on-Sea, Essex, where she was Principal at St Margaret School. Until the nineteenth century, Forest Gate was little more than a hamlet consisting of two or three gentleman‘s houses and a small hut occupied by the keeper of the gate from the forest, erected to keep cattle from straying onto the London to Romford highway. In the early 1800s residents included several leading Quaker families. It was a close knit community, with marriages linking these wealthy families. But, when the railway came to Forest Gate in 1841, this led to the rapid development of high quality homes for the new middle-class commuters as the old estates were sold to developers. Part of the area was developed as the Gurney housing estate, named after the Quaker, Samuel Gurney, who sold the land for development. Clova Road and Hamfrith Road, named after Hamfrith Hall, which was demolished in 1895, were part of this estate. Although post-war reconstruction has replaced much of the original shopping areas, other parts of Forest Gate remain untouched. Forest Gate has strong musical associations. It was for many years the home of the Tonic Sol-Fa Institute, which taught large numbers of people to play music without learning conventional notation. By 1885, Walter and Ellen were living at 10 Mornington Terrace, Wanstead. Walter was working as a Professor of Music. It was here that Ellen gave birth to the couple‘s first child, Arthur Beaufor, on 8 July 1885. Mornington Terrace is presumably the same place as Mornington Villas, which in the late 19th century were located on the northern edge of Wanstead Flats. Mornington Villas no longer exist: a housing estate now occupies the site. Wanstead Flats, also called the Lower Forest, extended over several parishes - Wanstead, West Ham, Little Ilford and Leyton. The parishes entitled to forest pasture grazed their cattle on the Flats, and in Epping Forest, each one marking their cattle with the parish brand. During the expansion of Victorian London the demand for land outside London for railways, houses and cemeteries resulted in the break-up of estates, and the Flats themselves were threatened. Public opinion was sensitive to this, and after the City of London‘s successful defence of commoner‘s rights in the courts, the Epping Forest Act of 1878 preserved the Wanstead Flats as part of the Forest controlled by the City of London and dedicated to "the delectation of the people forever". "Thousands on a Sunday evening swarmed over that open space, the largest crowd around the bandstand. The pond opposite Capel Road attracted several children and dogs. A young man was giving an account of his imprisonment and begged boys around to keep honest. We saw no single instance of roughness or disorder. About 9.00 pm the crowds began to disperse". "We enjoyed with breatless zest fat ladies, bearded women, pugilist champions, dramatic variations on such vivid and familiar themes as the murder of Maria Marten or the devastating tragedy of Michael Strogoff the maniac lover". "I pass out from beneath the garish glare, deafening din, sickly smell and crushing crowd marvelling more than ever how any human being can find one shred of pleasure or contentment in the midst of such a hideous pandemonium". In later years some would complain that the fair was showing signs of decrepitude, that the noise had lost its shrillness and the smells their pungency. By 1886, the family had moved to 75 Leytonstone Road. This was also the address of Walter’s business: by this stage he had taken up selling music and dealing in musical instruments in addition to teaching music. Had the family given up their home in Wanstead to move into premises above the shop? In any event, it was here, on 18 November 1886, that Ellen bore a second son, Berthold Philip. Poor Berthold died of tubercular meningitis and choleraic diarrhoea on 14 August of that year, at the age of just nine months. The house at 75 Leytonstone Road no longer stands. The village of Leytonstone roughly corresponded to the manor of Ruckholts, whose manor house stood at Temple Mills until 1757. By 1894 many of the eighteenth century mansions on Leytonstone Road had been replaced by newly built streets of terraced houses and villas, though several farms still remained. The transformation into suburban dormitory gathered pace after the Loughton Branch of the Greater Eastern Railway line opened a new station at Leytonstone in 1856. Cheap fares encouraged speculative building of houses for a growing market of people employed in new offices and industries, like the railways themselves, in London and neighbouring districts such as Stratford. On 14 December 1887, Ellen bore a third son, Leonard Walter, also at 75 Leytonstone Road. The following year, on 4 December, Ellen bore the couple‘s first daughter, Sophie Ellen. By 1890, the family had moved again, to 24 Margery Park Road, West Ham. Their next child, George Austin, was born here on 9 April 1890. Four days later, on 13 April, Leonard Walter died of tubercular meningitis. He was just two years old. Margery Park Road is located south of Romford Road and runs down to West Ham Park. The houses to the south of Romford Road tended to be of a higher standard than those to the north. The closer to West Ham Park, the higher the status and cost of the house would be. No. 24 was located at the end furthest from West Ham Park, but is still a good standard, sizable, end-of-terrace property. It now contains three flats. When West Ham Park was opened it was stated that "no greater boon could have been conferred on this populous district where poor and hard-working people are mostly engaged on useful and necessary but by no means healthy employment". The opening of the park on 20 July 1874 was celebrated as a holiday in Stratford, Plaistow and West Ham. Dr Pagenstecher commented in 1895 that "as the march of population is eastward and the old landmarks are gradually disappearing, it is a matter of supreme satisfaction that West Ham Park, this oasis in the midst of human habitation, has been preserved to the public forever as a place of rest and recreation". However, Walter’s business had by now run into trouble. The London Gazette of 12 September 1890 reports that Walter was adjudged bankrupt on 10 September 1890. He was trading as W J Minter & Co. His address was given as ‘8, Elm Road, Romford Road, Forest Gate, lately residing at 24, Margery Park Road, Forest Gate, and lately trading at 75, Leytonstone Road, Stratford, Essex, and 76, Broadway, Stratford, Essex’ and described as ‘Out of business, lately Music Seller and Musical Instrument Dealer’. The London Gazette of 23 September 1890 reported that the First meeting and the Public Examination were fixed for 2 October and 23 October respectively. The London Gazette of 21 November 1890 reported that an application for debtor‘s discharge was fixed for hearing on 19 December 1890. On 16 Jan 1891 the London Gazette reported that an application for release from bankruptcy was heard with the result that ‘Discharge suspended for one year. Bankrupt to be discharged as from 19th December, 1891‘. An absolute discharge was refused on the grounds that ‘Bankrupt had continued to trade after knowing himself to be insolvent‘. Referring back to the 1890 bankruptcy, the London Gazette of 8 November 1892 gives notice of release of trustees. Remarkably, the shop at 76 Broadway still exists, surrounded by modern shopping centres. An unspiring two-stoey building, it is now an amusement arcade. The move from Margery Park Road to Elm Road may have been necessitated by the decline in Walter’s business fortunes. Although Elm Road is only a couple of blocks west of Margery Park Road, the terraced house at no 8 is considerably smaller than 24 Margery Park Road. However, the house must have become increasingly cramped as, between 1891 and 1895, Ellen bore four more children: Stuart John (born 11 November 1891), Reginald Walter (born 12 April 1893), Mary (born 20 August 1894 but died the same day from premature birth) and Cyril Howard (born 2 November 1895, but died on 10 December of atrophia). By 1896, with five growing children, the family needed to find a larger home. They moved to 291 Romford Road, Forest Gate, a sizeable semi-detached property, built in 1876. Now known, together with its neighbour, as Lynby Villas, it contains 4 flats. It was at 291 Romford Road that Ellen gave birth to Eric Norman on 1 December 1896. Ellen subsequently bore two more children at 291 Romford Road: Bernard Leslie (born 5 March 1898) and Eleanor Georgina (born 23 November 1899). Somewhere between the birth of these two children, Walter gave up being a professor of music and became a hardware merchant instead. In 1901, the family were still living at 291 Romford Road. Walter had given up the music business and become managing director of a wholesale clothing company. Arthur was working as a clerk in an insurance company. By 1902, now with eight surviving children, the family moved to a still larger house at 190 Balfour Road, Ilford. This house, which was probably newly-built at the time, still stands. It is a large end-of-terrace property on the corner with Brisbane Road. Ilford was historically a small rural settlement in the county of Essex and its strategic position on the River Roding and the London to Colchester road caused it to develop as a coaching town. The arrival of the railway in 1839 eventually accelerated that growth and as part of the suburban growth of London in the 20th century, Ilford significantly expanded and increased in population. The population grew from 10,913 to 41,235 in the decade from 1891, and to 78,188 by 1911. This influx of people derived almost equally from those escaping inner London for a better life in the suburbs and Essex rural folk. Much of the new housing in Ilford was aimed at the rising middle-classes, white-collar workers and professionals, and right from the start there was a very high proportion of owner-occupiers. Balfour Road, which lies north of the railway line, was part of a development initiated by a builder named J.W. Hobbs and his associate Jabez Balfour. The two were convicted of fraud when their interlocking web of development companies and building societies collapsed in 1892. On 16 August 1902, young Eleanor died. She was only two years old. The death certificate shows the cause of death as ‘hepatitis, tetanus, coma’. In 1910, at the age of 17, Reginald left London for Melbourne Australia. He lived at Whitehorse Road, Box Hill, Victoria. On 21 April 1915 Reginald enlisted in the Australian Imperial Force 1914-18 and served in Infantry Brigade 6, Field Ambulance 6, Reinforcement 7. He embarked from Melbourne aboard HMAT Commonwealth on 26 November 1915. He later served as a corporal and returned to Australia on 6 September 1919 as a member of the 3rd Australian General Hospital (3AGH). He later returned to live in England. He did not marry. He retired to Dawlish, Devon, with his brother Stuart. He died in 1959 in the Exeter area at the age of 65. By 1911, Sophie had also left home and was working as a hospital nurse at the Royal Hospital Annex Convalescent Home in Ecclesall (near Sheffield), Yorkshire. The Sheffield Royal Hospital itself was closed and demolished in 1978. It appears that Sophie went to Australia for a while (maybe to see her brother Reginald?) as she is shown as returning to Tilbury on the ‘Maloja‘ from Brisbane in 1952 (having boarded in Melbourne). She died on 20 April 1976 at the age of 87. Her address at the time was Flat 4, Avondale Court, Avondale Road, Seaford, East Sussex. Arthur had also left home by this stage. He served in the Royal Engineers in World War 1 and later married Annie K Caron. They had four children: Arthur Cyril (born 7 June 1912 in the West Ham area), William A, Kathleen A and Queenie (who married Harry T Sims). Arthur died in 1961 in Southend-on-Sea RD at the age of 68. By 1911 the rest of the family had moved back to Forest Gate at 26 Earlham Grove, also part of the old Gurney housing estate. This house, which still stands, is a sizeable, semi-detached property, but smaller than the house at Balfour Road, no doubt reflecting the fact that several of the children had left home by then. Walter was working as a mechanical engineer. George and Stuart were described as clerks. George had been working as a clerk at C & R Light Ltd, Cartram Road, Cl, address 3 Khadars Road, Forest Gate. However, he had by then joined the 8th Batallion City of London Rifles on 5 January 1910, at the age of 19 years 9 months. In the High Court of Justice. - In Bankruptcy. 15th day of December, 1921. To GEORGE AUSTIN MINTER (trading as J. Edwards & Co.), sued in the Bankruptcy Notice as G. A. Minter (trading as J. Edwards & Co.), of 475 and 477, Bethnal Green-road, Bethnal Green, in the county of London, Furniture Manufacturer. TAKE notice, that a bankruptcy petition has been presented against you to this Court by Richard Gregory, of Numbers. 16 and 16A, Fuller-street, Bethnal Green, in the county of London, Builder and Decorator, and the Court has ordered that the publication of the notice in the London Gazette and in the Daily Telegraph newspaper shall be deemed to be service of the petition upon you; and further take notice, that the said petition will be heard at this Court on the 15th day of February, 1922, at 11.30 o‘clock in the forenoon, on which day you are required to appear, and if you do not appear the Court may make a receiving order against you in your absence. The petition can be inspected by you on application at this Court. - Dated this 17th day of January, 1922. 067 HERBERT J. HOPE, Registrar. George was the subject of a further bankruptcy petition in 1932, when he was recorded as residing at 107 Fairlop Road, Leytonstone. He was also recorded as living at this address in 1930 when he was informant for his father‘s death. He died in 1970 in Southend on Sea RD at the age of 80. Eric joined the Corps of Hussars of the Line on 22 August 1914 at Stratford (London), He served in Colchester in the Middlesex Regiment and was with the British Expeditionary Force in France from 25 July 1915 to 26 July 1917. He was admitted to Tooting Military Hospital on 27 July 1917 with ‘tubercule of lung’ and was discharged as no longer physically fit for war service on 8 October 1917, having completed 3 years and 49 days service. He was awarded the British War Medal and the Victory Medal. In 1920 Eric was living at 90A Station Road, Finchley, and working as a clerk. On 10 March 1920, he married Susan Lawrence, a 21 year old daughter of Daniel George Lawrence, a farm worker, and Susan nee Page (see below). NOTICE is hereby given, that the Partnership lately subsisting between us, the undersigned, Stuart John Minter and John Albert Reginald Kingham, carrying on business as Manufacturers of Mahogany and Hard Wood Articles of Furniture, at 119, Charlotte-street, London, W., under the style or firm of MINTER & VINCETT, has this day been dissolved by mutual consent so far as regards the said John Albert Reginald Kingham, who retires from the firm. All debts due to or owing by the said late firm will be received and paid by the said Stuart John Minter, who will continue the said business under the present style or firm of Minter & Vincett. - Dated the tenth day of October, 1927. Stuart was the informant for his mother‘s death in 1938, when both he and his mother were living at ‘Leahurst’, 134 Hadley Road, New Barnet. Stuart did not marry and retired to Dawlish, Devon, with his brother Reginald. He died in 1973 in the Newton Abbott area at the age of 81. Walter died on 8 October 1930 at Queen Mary‘s Hospital at the age of 70. The cause of death was given as heart failure and bronchopneumonia. His occupation at the time of death is recorded as pianoforte tuner. His residence was still 26 Earlham Grove. On 11 October 1931, at the age of 33, Bernard (usually known as Leslie) married Dorothy Evelyn Bull, the 31-year-old daughter of the late George John Bull, a coach painter, at the Register Office, Willesden, Middlesex. He was working at the time as a civil servant and living at 108 Review Road. They had two children: John B (born in 1937 in Hampstead RD) and Trevor H. Bernard died in 1979 in Westminster RD aged 79. Ellen Sophia died on 22 May 1938 at the age of 78. The cause of death was given as carcinoma of breast. Her residence at the time was ‘Leahurst’, 134 Hadley Road, East Barnet, where she was living with her bachelor son, Stuart. This house which would have stood just south of Hadley Common, no longer stands. A block of private flats, known as Hadley Heights, now occupies the site. On 21 September 1920, Susan gave birth to the couple‘s first son, Eric Laurence, in the City of London Lying-In Hospital. On 9 August 1922 at Edgware, Susan gave birth to a second son, Norman Leslie. On 8 June 1929, at Redhill Hospital, Edgware, Susan died of haemorrhage and shock from a curettage following an incomplete abortion. She was 30. At the time, they were living at 133 Buckingham Road, Little Stanmore. On 30 March 1931 at Little Stanmore Parish Church, Eric married Agnes Mary Lee, a 43-year-old widow. At the time of the marriage, both were living at 133 Buckingham Road. On 28 February 1950 at the age of 53, Eric died of carcinoma of bronchus. At the time, he and Agnes were living at 2 North Street, Leigh-on-Sea. Eric‘s occupation was recorded as tax officer (Inland Revenue).